Cody Weddle was detained along with a colleague, press union officials tweeted. 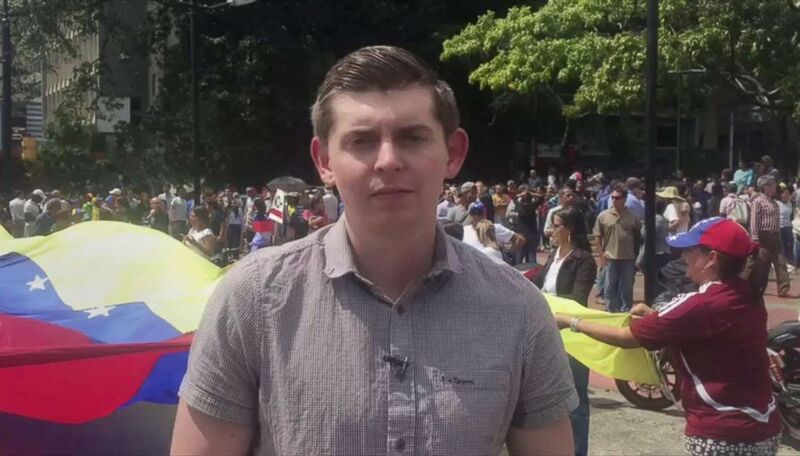 American journalist Cody Weddle, who was arrested in Venezuela's capital Wednesday morning along with a Venezuelan colleague, has now been released and is being deported, he told ABC News. Two Venezuelan government officials also told ABC News that Weddle was released and was being deported to the United States. Military counterintelligence officials raided Weddle's apartment in Caracas Wednesday morning, taking him into custody along with his assistant, Carlos Camacho, officials with Venezuela's National Union of Press Workers said in a Twitter post. The syndicate said late Wednesday afternoon that Weddle and Camacho were being interrogated in the headquarters of Venezuela's Directorate General of Military Counterintelligence. Camacho was released after about 12 hours, union officials said late on Wednesday. Weddle, a freelance reporter based in Caracas, has contributed reporting to a number of news organizations, including ABC News. Being a journalist is not a crime; the world is watching. “We’re deeply concerned by reports Cody Weddle and his colleague have been detained in Venezuela, and we urge the Venezuelan government to ensure their safety and to release them immediately," an ABC News spokesperson said in a statement. #URGENTE | Familiares confirman la liberación de Carlos Camacho, asistente del corresponsal internacional Cody Weddle, que fue detenido por la Dgcim la mañana de este #6Mar. (ABC News) Reporter Cody Weddle reports for ABC News from Venezuela, Jan. 30, 2019. Kimberly Breier, the United States' Assistant Secretary of State for Western Hemisphere Affairs, tweeted that the State Department was "aware of and deeply concerned with reports that another U.S. journalist has been detained" in Venezuela. "We demand the journalist’s immediate release, unharmed," Breier added. "Being a journalist is not a crime; the world is watching," a State Department spokesperson told ABC News. Both U.S. senators from Florida, Marco Rubio and Rick Scott, tweeted about Weddle's case, calling for his release. With Wednesday's arrests, the number of journalists and press workers imprisoned this year rose to 36, officials with the Venezuelan press union said. ABC News' Aicha El Hammar Castano contributed to this report.